DANCING IN THE MOONLIGHT and Who Let The Dogs Out? Recently while on charter in the Southern Bahamas there was the super moon! This picture was of the moon in the penultimate evening of the super moon, twas a clear and dreamy sky. We could not help but dance in the Bahamian moonlight! "Dancing in the Moonlight" is a song written and originally recorded by the French-American rock group King Harvest. It was released as a single in 1972 and reached number 13 on the Billboard Hot 100. In 1994 the Baha Men released the song as a single, but it also failed to chart. Their version was later used in the movie Fat Albert. In 1994 Baha Men music was also featured in the movie My Father the Hero. The movie was mostly filmed on Paradise Island with a purpose built set on Cabbage Beach. "André Arnel (Gérard Depardieu), a Frenchman divorced from his wife, takes his teenage daughter, Nicole (Katherine Heigl), on vacation with him to The Bahamas. She is desperate to appear as a woman and not a girl, so in order to impress a local boy Ben (Dalton James), she makes up more and more ridiculous stories, starting with André being her lover and leading to some bizarre assumptions by the rest of the community." The film featured music and appearances by the Baha Men. The group's songs create the movie's island soundtrack. "Gin and Coconut Water (Traditional)"
"Land of the Sea and Sun"
Yacht Sweet Escape has a huge library of films that feature The Bahamas. Be sure to ask for recommendations as the list is extensive! You may want to dance in the moonlight every night while on charter, with an amazing audio system onboard you can find your groove. OCEAN ATLAS: The Largest Underwater Sculpture in the World! Did you know that The Bahamas is home to The World’s Largest Underwater Sculpture? 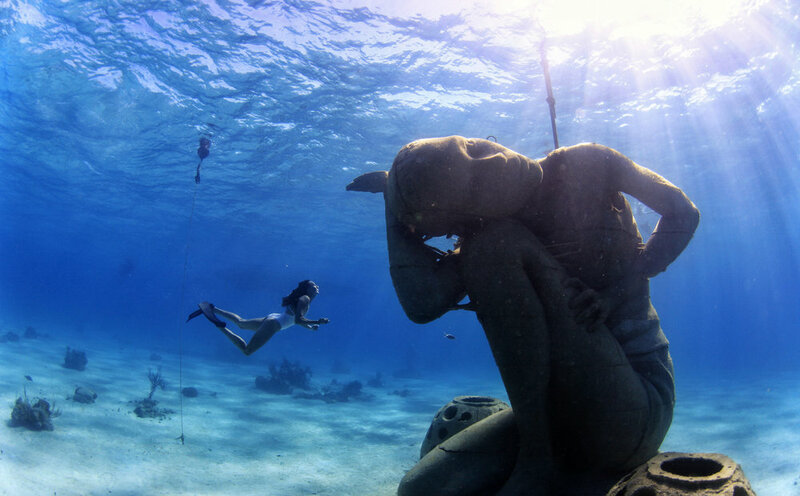 Installed October 2014, a short swim off the coast of western New Providence, British sculptor Jason de Caires Taylor’s Ocean Atlas is 18-foot-tall statue of a young Bahamian girl who appears to be holding up the ocean. The work alludes to Titan Atlas of Greek mythology, who holds up the heavens. This sculpture is depicted as a young local Bahamian girl sustaining the ceiling of the ocean, symbolically represents the shouldering of the environmental burden we are asking of younger future generations. The sculpture has captured the attention of artists and divers from around the world. Jason deCaires Taylor is no stranger to underwater sculptures, and is known around the world for his amazing installations using pH-neutral concrete that are accessible by swimmers, snorkelers and scuba divers. Over time, his sculptures change colors and become covered with coral and biological growth, eventually becoming home to new organisms as artificial reefs. The sculpture commissioned by B.R.E.E.F (Bahamas Reef Environment Educational Foundation) aims to create an underwater sculpture garden in honor of its founder Sir Nicholas Nuttall. It includes other sculptural works by local artists Willicey Tynes and Andret John and an artificial reef trail designed by Reefball. With our oceans and coral reefs currently facing collapse from numerous threats including; overfishing, habitat loss, ocean acidification, global warming and water pollution the piece symbolizes the burden we are currently asking future generations to carry and the collective responsibility we have to prevent its collapse. The work, which during low tide will reflect a mirror image on the underside of the sea’s surface, is a dramatic increase in scale from Taylor’s previous works and ensures that even after substantial coral growth the figure will still remain highly recognisable. A solar light and flag is located on the highest point to aid marine navigation. Constructed using sustainable pH neutral materials it creates an artificial reef for marine life to colonise and inhabit, whilst drawing tourists away from over stressed natural reef areas. Not far from Rudder Cut Cay, (one of the magician David Copperfield’s resort islands), is a sunken statue of a mermaid. The sculpture is officially named The Musician and was also created by the artists Jason DeCairnes Taylor. David Copperfield installed the underwater sculpture off the SW coast of Rudder Cut Cay to amuse his resort guests. The underwater sculpture consist of a stainless steel mermaid lying in attentive rapture on the seafloor near the bench of a baby grand piano with open lid. Currents are quite strong in the area making it a challenge to see the sculpture in the crystal clear water. Exuma’s the only place in the world you can tickle some keys or swim with a mermaid…even if they are stationary. The trip to Rudder Cut Cay will take you past Musha Cay and further south you will find Big Farmers Cay. Located just south of Big Farmer's Cay, is a stretch of pure white sand which emerges from blue-green water at low tide. It is widely known as the "Mile-long Sandbar" and is perfect for shelling, sunbathing, and picnicking. You will have it all to yourself on most days! photos and information courtesy of B.R.E.E.F. The clear and pristine water of The Bahamas allows for incredible views beneath the surface as well as those fantastic pink powder beach vistas. Snorkelers have a panoramic view seen through glass. This crispness creates confidence in the more intrepid of nautical explorers because one can see exactly what’s in front of you and for that matter, in every direction! The art of SCUBA gives a immersive experience of all the wonderful Atlantean and mythical treasure The Bahamas has to offer. The draw back is, of course, it requires certification. With a dive master onboard, there is no better place in the world to gain your certification! The water of The Bahamas stays between 72 and 83 Fahrenheit, or 22-28 degrees Celsius, year round. No wetsuits needed, although shorties are available onboard; for SCUBA diving there a variety of thicker full-body suits and booties also available. The warm and sheltered waters are ideal year round for snorkeling and SCUBA diving. There is no real wind-chill factor and regardless who could resist a plunge in the hot tub to soothe the wary muscles after a fun filled afternoon. With snorkeling in The Bahamas, the experience becomes three dimensional, and by far not a sacrifice to the more rigorous SCUBA activities. Snorkeling can be preformed by the less confident of swimmers while offering the ability to wear a life-vest. The shallow waters are abundant with marine life for close encounters as loved by SCUBA divers. Snorkeling is an easy and fun activity for any level of adventurer. The wonderful shallow waters of The Bahamas have a variety of shipwrecks, sunken planes, as well as man-made sculptures, by the talented artist Jason de Caires Taylor, that appeal to everyone; there is even an underwater train wreck! Along with the plethora of natural beauty including water in every hue of turquoise, the motley of marine life in The Bahamas is effervescent as abundant. Starfish of every variety, shells and corals, schools of fish that leap into the sunshine are all a common sight; so are the larger variety of marine life inclusive of turtles, rays, dolphins, manatees, and of course the very docile nurse shark. This variety of marine biology that is within a mere few feet of water can make what is know as a gentle activity of snorkeling, what can be traditionally be referred to by SCUBA enthusiasts as a lesser experience, to one that is riveting and unparalleled by other regional snorkel locales. Wether you are an experienced SCUBA diver or a novice snorkeler, The Bahamas is the ideal place for an underwater excursion. 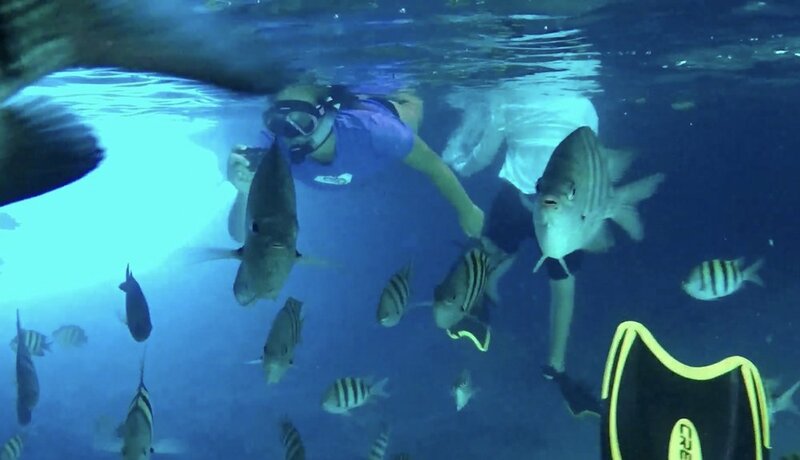 Don’t hesitate to let Captain Paul, also a master diver, show you the best of The Bahamas. One of the many advantages of yacht charter is that the location of your dive can be tailored to your desires, there are 700 islands to choose from. In the Bahamas there are magnificent blue holes, sea walls and drifts and coral, and sculpture gardens. There is no shortage of ideal locations for any level of diver so that the entire family or group can be catered to without any trade-off of adventure. Beneath Earth’s waters it is estimated that there are 3 million undiscovered shipwrecks. Of course, after the shark dive experience with Stuart Cove’s, a huge romanticized draw to diving in Bahamian waters is the prospect of finding treasure. The story of the Nuestra Senora de la Maravilla is one of the few true successful discoveries. In 1656, having been grounded in a mere 30’ of water then sunk off the Little Bahama Bank, while carrying five million pesos of treasure, the Spanish ship Nuestra Senora de la Maravilla was rediscovered in the early 1970’s. Since her discovery, having been one of the largest find in the 20th century, the wreck area is still being searched today, but officially the Bahamian government has not granted any leases on the site since the early 1990s. It is possible the bulk of the treasure has yet to be claimed, with over half of the official cargo still unfound today! Just about every island in The Bahamas will have its own beloved pirate mascot like Arthur Catt for Cat Island, Captain Morgan in Andros, Blackbeard just about everywhere and many more. Furthermore each island will have folklore of buried treasure that has never been found by land or lost at sea. Although Captain Paul cannot promise you will find much of these lost treasures while snorkeling, you will make memories that are unfathomable while on your charter with Yacht Sweet Escape. While the rest of these sites can prove to be quite beautiful, they are no match for what Staniel Cay has in store. A visit to Staniel Cay, the jewel in the crown of the Bahamas, provides you with some of the very best snorkeling in Bahamas. The incredible diversity of sites here is why this destination is worth a visit. For a start, you can take a short boat trip out to Thunderball Grotto and get lost in the exciting world of James Bond. This site was used in the filming of the 1965 Bond movie “Thunderball” which led to the naming of the Grotto. Swimming through an underwater tunnel to emerge in a shimmering cave full of turquoise light is something that every snorkeling enthusiast should experience. If you feel inclined to visit some less natural sites, then Staniel Cay will also grant you access to the wreck of a drug smuggler’s plane. This fascinating site displays the damaged wreck of a small aircraft surrounded by nothing but clear turquoise water and a soft white bed of sand below. Setting out from Marsh Harbour, the largest settlement in the Abacos, you will have a plethora of different sites available to visit. Amongst these, you will find Green Turtle Cay to be one of the very best destinations. This island has an enchanting ambience both above and below the waves. Snorkeling here will allow for endless coral exploration blended with the flurry of fish that call this area home. While Long Island certainly provides its fair share of great coastal snorkeling sites, the real attraction here is Dean’s Blue Hole. The world’s second deepest blue hole and the site of many freediving competitions, this site has a little something for everyone, including snorkelers. You won’t need to swim out above the cavernous blue hole to get a taste for the its beautiful mystery. Snorkeling around the shallows, with soft sand and crystalline water can serve as an excellent use of your time. The tiny island of Bimini can be found on the western outskirts of the Bahamian archipelago. This destination boasts warm currents and a range of diverse coral reefs to explore. Bimini Road is one of the most popular of all the snorkeling sites, home to a series of stone monoliths that are rumoured to be part of the lost city of Atlantis. Your trip to Bimini will also be one of the most lively underwater experiences you have on your Bahamas snorkeling tour. Rainbow Reef is a magnificent and colorful coral ridge that plays host to one of the largest fish populations in the country. Alternatively, you could choose to visit Stingray Hole, which is aptly named due to the countless stingrays that call this reef home. 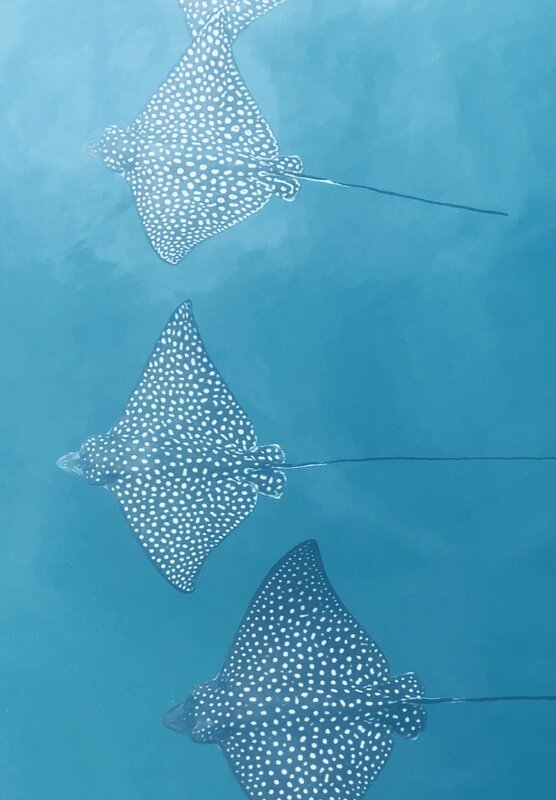 In fact, if you bring along some fresh fish strips on your snorkel, you’ll even have the chance to feed these stingrays right from your hand. Another excellent wreck-site close to Bimini is the remains of the Sapona. It was damaged during a hurricane in 1926 which led to its watery grave. However, it is one of the few wrecks shallow enough to snorkel and offers some of the best snorkeling in Bahamas. It’s sites like this one that make Bahamas snorkeling so unique. From the city of Freeport on Grand Bahama alone, there are a number of different Bahamas snorkeling tours to choose from. Freeport Bahamas snorkeling is very popular because of the calm waters, and diverse sites, providing excitement for both beginners and experienced snorkelers. Not to mention its proximity to Miami, being the nearest Bahamian settlement to Florida. Amongst other truly great destinations, the most visited site is undoubtedly Deadman’s Reef. The reason this site is so popular is that it displays both extensive coral heads as well as playing host to a thriving marine life population. Sites like this one are generally found much further offshore and require a boat trip to visit, but Deadman’s Reef is near enough to Paradise Cove to swim.